In Susko’s second book of poems in English, a dizzying, exhilarating, unnerving meditation on war, survival, history and self, the act of poetry turns nightmare into reality and history into dream…. He has brought personal and public suffering and terror to that very edge where we can hardly bear them any longer and turns them and his verse into something beautiful and terrifying at the same moment. 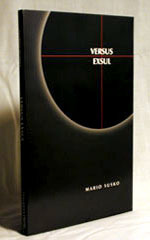 There is a steady and relentless power in Versus Exsul. We are slowly pulled through a Universe of Pain all the more vivid than Rilke’s for being firmly here on earth, in the present, in the senses of People Like Us, “as if pigeons could be the earthly spies of eagles.” Above all, it is the experience of thinking, ceaseless as a bodily function, that links Versus Exsul in all its disparate parts, its lands distant and close, its stages of memory–thinking as the condition of breathing.